In this article, we have collected 28 new best websites themes of 14th October 2014. This themes are well-designed and have lots of great features. MusicHub is the best theme for music, club, party, radio station, bands, events, or blogging. The theme have a modern design and is very flexible allowing your to customize all you want. Uncle Hummer Responsive WordPress Building Theme is Modern and clean type WordPress Theme with great typography. This Theme contains latest features to give your site a trendy look with HTML5, CSS3, less, Visual composer page builder, Revolution Slider. Blister Joomla is a responsive Business site template that has clean and elegant design for business or corporate. This site template completed with variant and 25 unique pages. Blister Joomla use Powerful T3 Framework Joomla and For Shopping use premium Joomla ESHOP Component. Port is a beautiful and stylish portfolio theme with a responsive layout and a focus on clean typography. Whether you are building a site for a creative agency, a startup, or a freelance designer, this theme is all about creating a stunning presentation for your content. Health Care is a powerful multipurpose responsive WordPress theme suitable for medical and health related businesses. Its fresh and clean design makes it applicable for corporate websites, personal blogs, product-oriented sites as well. Boksy is a clean and minimal responsive WordPress theme for personal bloggers. Putting content first is the key focus in the overall design. It looks good both on large and small screens. Features include featured posts slider, blog posts with or without sidebar widgets, footer widgets, social media at footer, post format styling and much more. GoodPoint is a mobile ready responsive Multipurpose WordPress theme allowing you to build an awesome portfolio, presentation site or online shop on all screen sizes and devices from mobile phones to desktops. Candela is responsive and creative portfolio WordPress theme for agency, freelancers, artist and corporate. The unique design make the showcase standout from others. It is also designed to be straightforward to the main content, without being distracted with other less important components. Easel minimal WP theme is a perfect solutions for bloggers and website owners who love minimal design. Minimalist & modern design makes your work & content standing out. No clutter, no excess - clean & simple theme. Zephyr is multipurpose WordPress blog theme for food lovers, fashions and beautiful persons of who love blogging. Zephyr comes in both boxed & full-width versions. Ticket is a clean, responsive HTML email template great for newsletters, promotions, marketing, and announcements. Ticket includes a basic HTML version as well as support for Campaign Monitor and MailChimp. Maniva PSD Template has 3 colors option. Those are yellow(default color), pink, blue. It’s 1170px Bootstrap grids based. You will see a mobile page too. Bakery is a powerful and Rich Template made specially for bakers and cake shops. It has included a variety of skins and also a boxed and a wide version. It is built upon Bootstrap 1170px Grid, and it has Retina Ready Icons. Bromic – is a new improved template that includes everything necessary you need for your website. It can be a great choice for your eCommerce site, Corporate Site, Portfolio Theme, Creative Agency etc. This PSD can easily satisfy all of your needs. Baratheon is a all purpose super Template. And it can be easily customized for any market whatsoever, also it was 100% mobile responsive design to perfect look on any devices. Electoral is a political / non-profit multi-page HTML template fit for political campaigns, political poofile websites and even non-political websites. Lamar is an Responsive Multipurpose Resume Timeline is fit for any kind of industry, onepage resume, easy to customize, Clean and valid HTML5 - Validated with W3C. It comes in Dark & Light Version. A content-focused Tumblr Theme with a bliss, mobile-friendly masonry layout. Crafted to be an ideal showcase for digital goods, clothing. This theme supports/displays Submissions & Ask mode. 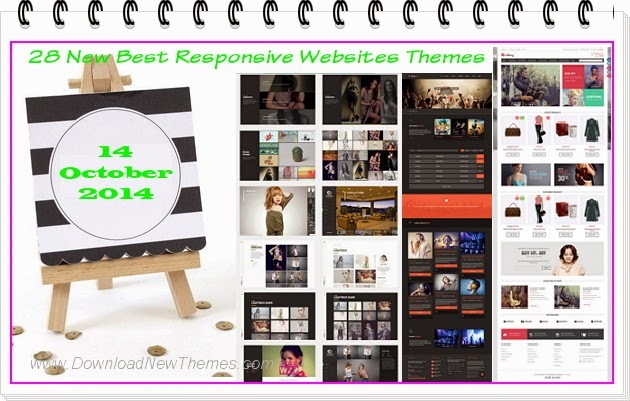 Item Reviewed: 28 New Best Responsive Websites Themes (14th Oct 2014) 9 out of 10 based on 10 ratings. 9 user reviews.